The World. North America. Canada. Ontario. Canada’s Economic, Political and Territorial Evolution: from its beginnings to the present day. Plus outline maps for creating your own maps. Vibrant colours – Modern graphics – Spacious layout – Straightforward vocabulary and symbols. The wall maps are mounted on vinyl bands with sliding hooks for easy usage. Easy to use: light, compact, laminated on both sides with a matt washable finish. Attach them to the wall or to each other, or place them on a table or the floor. Amerix Wall Maps are comprehensive teaching tools for the classroom. Study, understand and create maps with Amerix Wall Maps! Amerix Digital Maps are available in PDF format for use on different devices for both series: History and Contemporary. Amerix Wall Maps are mounted on sturdy vinyl strips with sliding hooks. 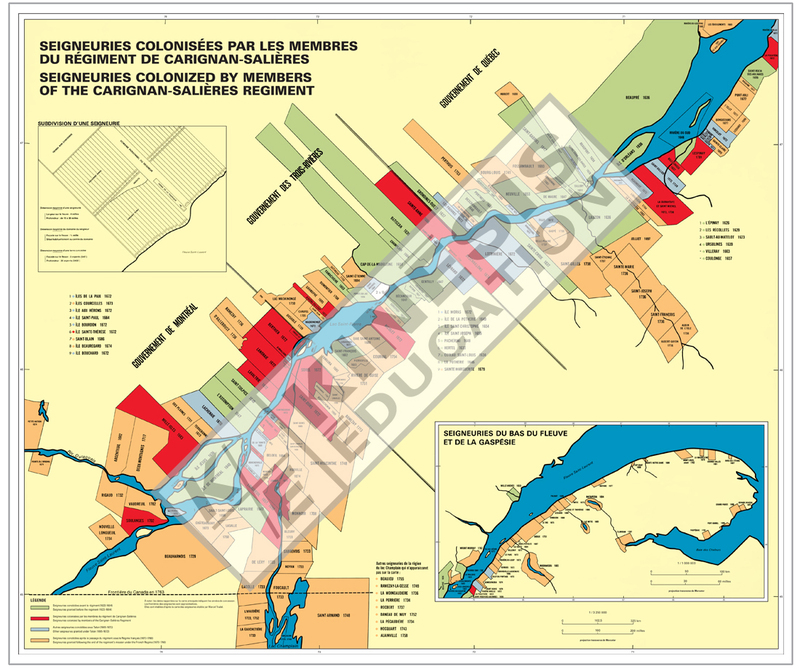 This map series of significant historical events teaches students about Canadian history : from the Constitutional Act of 1791 to Canada Today (the creation of Nunawut). Our political map series teaches students about the world, North America, Canada, Quebec, Ontario, and their various administrative regions. Students discover how neighbouring countries and provinces are divided, broadening their understanding of the world. The maps illustrate countries, provinces, and main cities, plus the main road and rail networks. Elements of physical geography such as oceans, seas, lakes, and waterways are also indicated. Each map comes with a teacher’s guide of suggestions for use. This map series teaches students about topographical, hydrographical, and other elements of physical geography. Students can identify several details at a glance, such as drainage basins, electrical power plants, and the rail network. Teachers and students alike will find the maps easy to use, with a complete legend that’s easy to read. Our physical map series includes Canada, Quebec, and Ontario. Each map comes with a teacher’s guide of suggestions for use. This map series lends itself to a multitude of pedagogical uses. Maps include capital cities, geographic areas, and main river systems to make interpretation and orientation easier. Create your own thematic maps without tracing approximate map outlines on the board. Write or stick photos, illustrations, or drawings on the maps—all our maps can be washed with water. Our outline map series includes the World, North America, Canada, Quebec, and Ontario. Each map comes with a teacher’s guide of suggestions for use. Want a Amerix custom-made map of your province, territory, region or for an historical event? It’s easy! This is a sample of a custom-made map produced for an exhibit held at Château Ramezay – Historic Site and Museum of Montréal from 2014 to 2017.